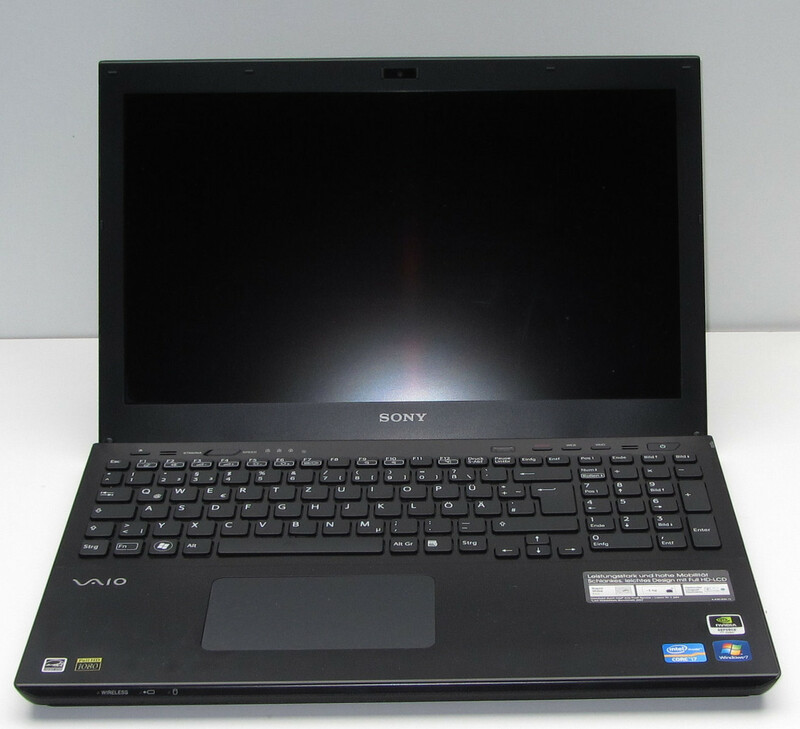 The Sony S-series of laptops are famous for slim form-factors. They have been updated with the latest Ivy Bridge hardware. The S-series includes the 13.3-inch and the 15.5-inch form-factors with variable hardware configurations. 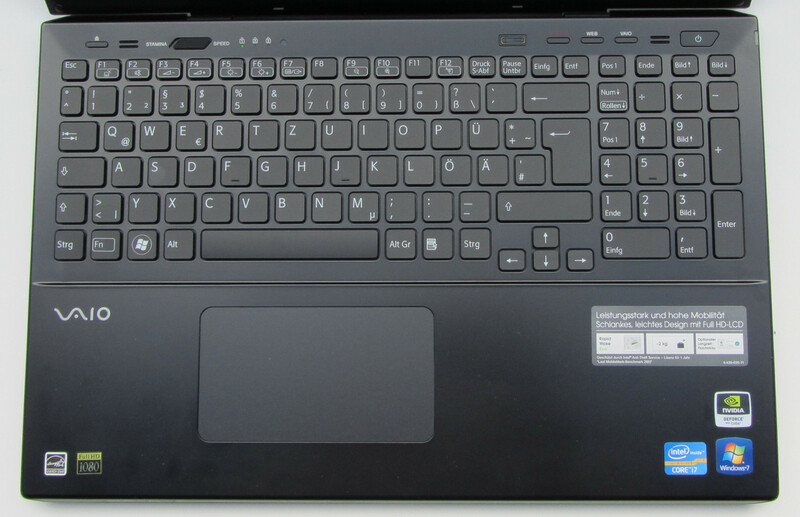 The laptop for this review is the SV S1511X9E/B. The laptops are customizable on the Sony website with a decent spread of choices available for the consumer. The cheapest variant of the 15.5-inch set is the 967 Euro (~$1250) version which comes without dedicated graphics. The most expensive version would be the 3000 Euro (~$3750) version that comes with a 512 GB SSD that adds about 1200 Euro (~$1500) to the cost of the laptop. Our review device is powered by an Intel quad-core processor (Intel Core i7-3612QM). The graphics processing duties are shared between the Nvidia graphics chip (Nvidia GeForce GT 640M LE), and the Intel graphics chip (Intel HD Graphics 4000). It also comes with a 128 GB SSD for data storage. 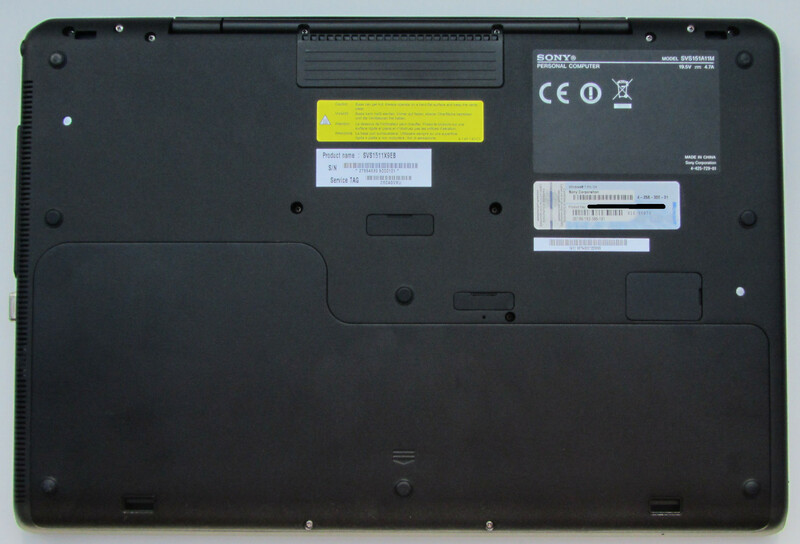 Sony has also equipped the notebook with 8 GB of RAM, and a DVD burner (slot-in drive). Looking at the features of the notebook, Sony has clearly attempted to make a multimedia device which is supposed to appeal to business users. In addition to this, the relatively thin case should also appeal to Ultrabook fans. Sony has attempted to squeeze several notebook types into one device. Whether this has been a success will be determined by our review. Possible competitors of the Sony SV-S1511X9E/B, are the Acer Aspire Timeline Ultra M5-481TG (Intel Core i7-3517U, Nvidia GeForce GT 640M LE), the Toshiba Satellite P855-107 (Intel Core i7-3610QM, Nvidia GeForce GT 640M), the Sony VPC-SE2M9E/B (Intel Core i7-2640M, AMD Radeon 6630M) and Dell's new XPS 15. Taking the price segment into account, the new Apple MacBook Pro "Retina" could also be worth considering. Our reviewed device has black surfaces. The back of the lid is roughened. Underneath is a maintenance panel. The case is relatively thin. 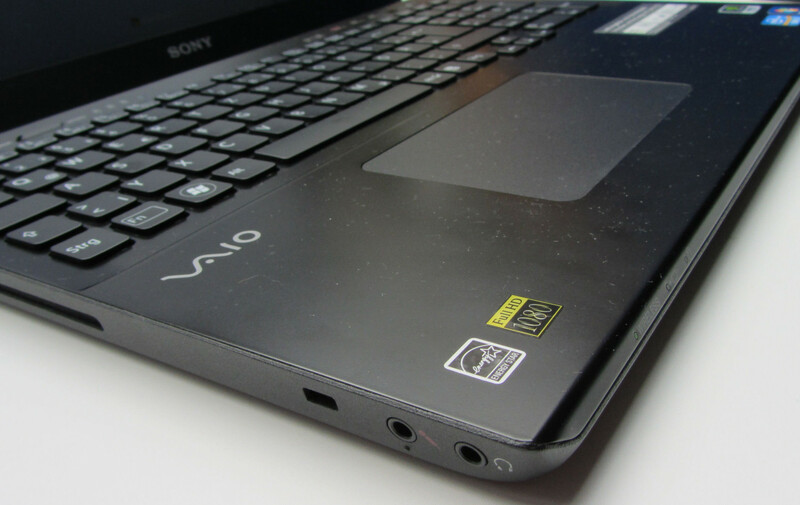 The Sony SV-S1511X9E/B is relatively close to the requirements of an Intel Ultrabook (maximum height: 21 mm or about 0.82 in) with its height of 23.9 mm (~0.9 in). But this isn't an Ultrabook. In addition to this, it is also relatively light for a 15.5-inch notebook with a weight of just under 2 kg (~4.4 lb.). The case of the notebook is made of magnesium and is covered with black paint. The palm rest area is made of black colored aluminum. The laptop looks beautiful and the surfaces and the surface is coated with matte black which is a point in its favor. Sony also allows you to choose other colors like silver and white. The display bezel and the upper part of the keyboard area have a smooth surface, while the top of the lid is roughened for more traction. Overall the lid and the base unit are generally not prone to accumulating fingerprints. The manufacturing quality can be described as very good without qualms. The gap sizes are even, and nothing squeaks. The stability on the other hand could be better. For instance when lifting the open notebook at opposite corners, the case warps a little bit. The palm resting area doesn't bend with pressure. It’s a different picture when it comes to the keyboard and its supporting area though. Anyone typing with this keyboard will notice that the keys always yield a little. When paying 1600 Euro (~$2000) for a notebook, you would certainly expect the best build quality. The hinges hold the display firmly in position, but are not too stiff. Opening the display with one hand is easily possible. Sony has found a good compromise between ease of use and stability in this regard. However, the display does wobble a bit when letting it go suddenly, and also bends slightly. This could have been expected from such a thin display though. The back of the display is very firm and stable, and the lid can hardly be dented. When it comes to the connectivity, Sony's notebook doesn't provide any surprises. No more than the basic requirements are available. On the left side of the device are the microphone and headphone jack. A socket for a Kensington Lock is next to the two audio ports. The remaining interfaces are located on the right side of the device. These include three USB ports, two of which support the USB 3.0 standard. In case the notebook needs to be connected to a television, or a monitor, then the HDMI output should come in handy. A projector can be connected to the VGA output. Last but not least, there is also a Gigabit Ethernet port available. Sony has equipped the SV-S1511X9E/B with not one, but two card readers: One for standard SD cards, while the other for the proprietary Sony Memory Sticks. 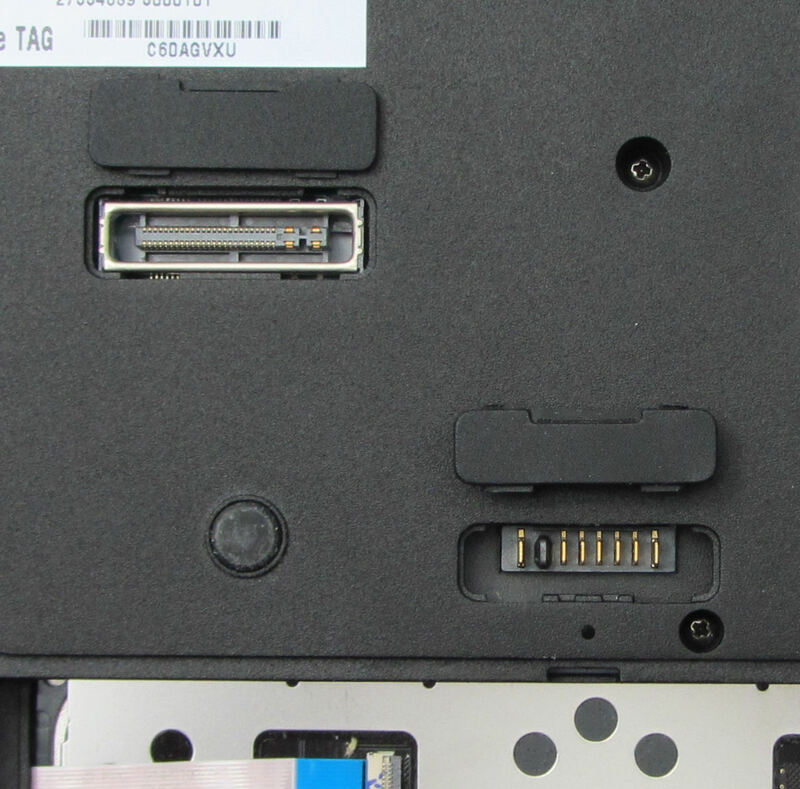 On the bottom of the case there is also a docking station port and a connector for an external battery. The compatible "VGP-PRS35" Sony docking station is currently available for between 160 and 170 Euro (~$200-$215). The docking station extends the connectivity of the notebook by three USB 2.0 ports, two Gigabit Ethernet ports, and one HDMI and VGA port. In addition, there is also a 500 GB hard drive in the device, which can be used for backing up data. On the left side are the audio connectors, and the DVD burner (slot loaded). On the right side are the remaining interfaces, and the card readers. The heat from the device is blown out of the back. The "Vaio Smart Network" tool makes it possible to quickly switch on and off wireless modules. In order to make connections with a hard wired network, a Gigabit Ethernet chip made by Realtek is included in the notebook. 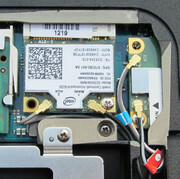 Connectivity with wireless networks is accomplished by using the WLAN module from Intel (Centrino Advanced-N 6235). The module supports the standards 802.11a/b/g/n, and additionally also provides Bluetooth 4.0. In cases when there are no LAN or wireless networks available, then the notebook is also able to connect to the mobile phone network. This function is provided by the UMTS modem "Gobi 3000" from Huawei. The modem provides download speeds of up to14.4 MB/s and upload speeds of up to 5.76 MB/s. The actual data speeds of course vary depending on the network conditions such as available capacity. Video conferencing and video telephony are also possible using the webcam in the display bezel (1.3 MP). Along with the usual socket for a Kensington Lock, the notebook also has a fingerprint reader included. The fingerprint reader can be used together with the pre-installed software "Authentic TrueSuite". This allows access to Windows, as well as internet websites to be restricted. Compared to its predecessor, the Sony VPC-SE2M9E/B, the fingerprint reader has been given a new location. It no longer sits between the mouse buttons of the touchpad, but instead above the keyboard. A TCG-1.2 compatible TPM chip is also inside the notebook. 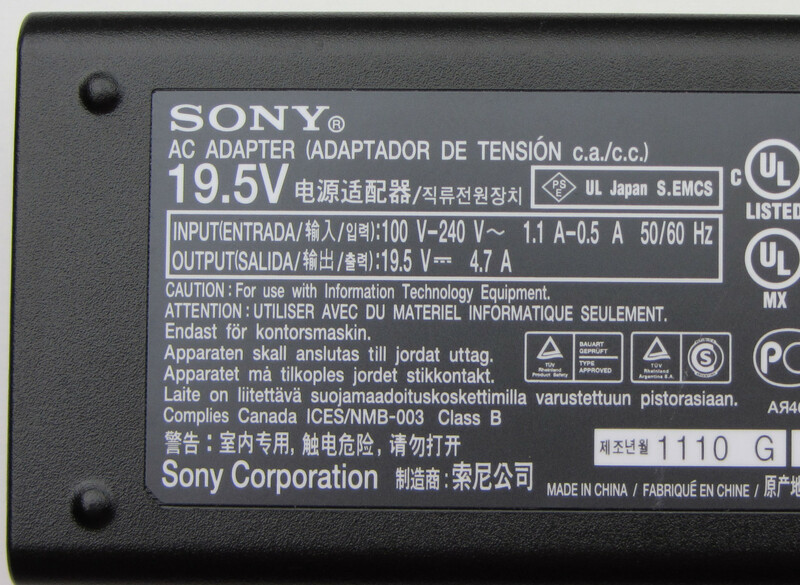 Other than the notebook, and the AC adapter, the box that the Sony SV-S1511X9E/B comes in only contains a few thin user guides. A Windows 7 DVD is not included. Recovery of the system is possible with the help of the recovery partition. Additionally, a recovery DVD can be created with the help of the Sony tools. Those wanting a full-fledged Windows 7 DVD on the other hand can find out how to acquire one in one of our news articles. Sony has pre-installed a lot of programs. Among these is McAfee Internet Security. With the help of McAfee Online Backup, it is possible to save personal data in the cloud. The playback of DVDs is covered by Cyberlink's Power DVD. The multimedia selection of programs Imagination Studio Vaio Edition is also pre-installed. This consists of the programs "Acid Music Studio 8" (music editing and creation), "DVD Architect Studio 5" (create DVDs), "Media Go", "Sound Forge Audio Studio 10" (audio recording and editing), and "Vegas Movie Studio HD Platinum 11" (video editing). Before these programs can be put to good use, users have to register with Sony. The corresponding dialog box is opened when starting one of the particular programs. There are no additional costs. Microsoft Office 2010 Starter, Adobe Acrobat X Standard and Skype can also be found on the hard drive. Along with these, Sony has also included several of its own tools, some of which are very useful. 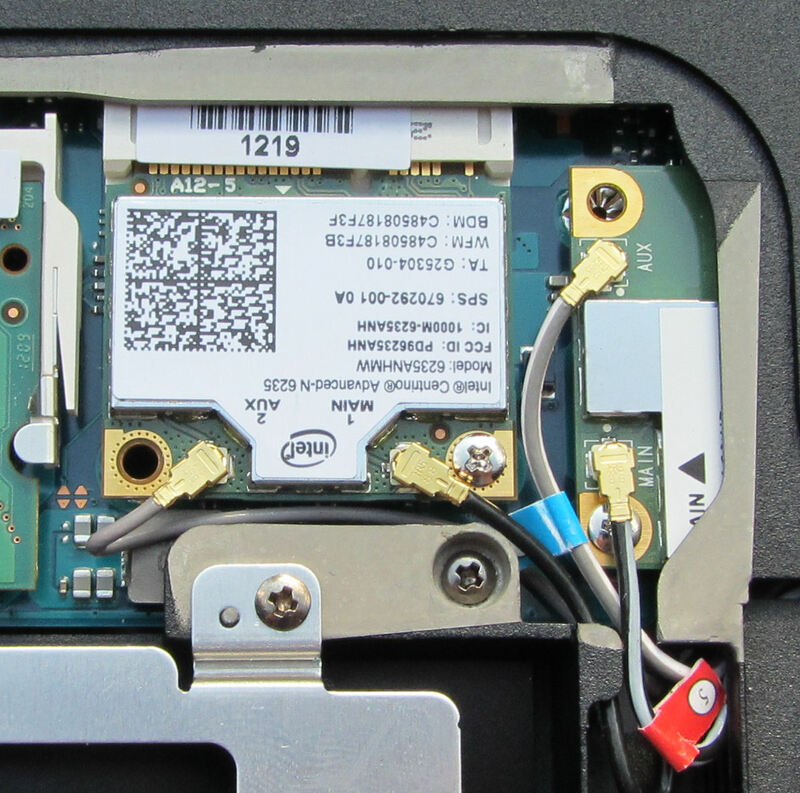 For example, "Vaio Smart Network" allows the wireless module to easily be switched on or off. 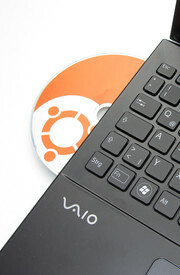 In the category "nice, but not necessary", the tool "Vaio Gesture Control" can be found. This allows Internet Explorer or the media player to be controlled with gestures which are recognized by the integrated webcam. 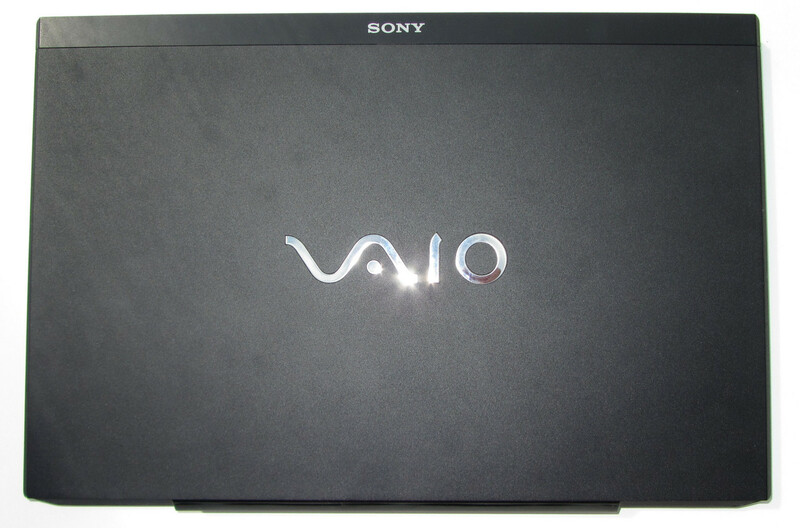 The pre-installed programs can be started from Vaio Gate. A panel for opening Vaio Gate appears as soon the cursor is moved to the top of the screen. Maintenance of the notebook proves to be easy. On the bottom of the case there is a large maintenance panel, behind which most of the components can be found. The first thing that catches the eye is the battery. This is not permanently attached to the device and can easily be removed. The hard drive could theoretically be upgraded, since Sony also provides the notebook with a conventional hard drive. 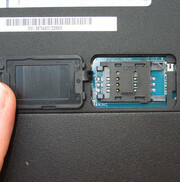 However, the provided hard drive enclosure and connection cable are not made for standard 2.5 inch hard drives. Whether Sony can provide the required components at request is not known. In any case, it may be possible to procure the necessary parts from a seller not affiliated to Sony. For those placing a high priority on the possibility of upgrading the hard drive, it would probably be a good idea to select a model of the notebook with a standard hard drive. In this case it shouldn't be a problem upgrading to the storage device of choice, be it an SSD or another slow mechanical hard drive. The notebook is equipped with 8 GB of RAM. Four Gigabytes of this are permanently integrated into the device and cannot be changed. 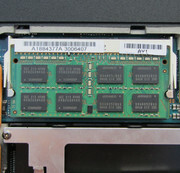 The remaining four Gigabytes are installed as a standard RAM module inserted into a socket. The upgradability of the RAM is possible to a limited extent since the notebook supports a maximum of 12 GB, where you will need to replace the 4 GB module with an 8 GB module available for a premium. This would have the disadvantage of not being able to use the dual-channel mode for slightly faster performance, since this is only possible if both RAM banks have the same memory capacity. The maintenance panel also provides access to the WLAN module as well as the UMTS module to a limited extent. Cleaning the cooling fan is not possible from the inside. Sony provides the SV-S1511X9E/B with a one year ‘Bring-In’ warranty. Owners must send the notebook to Sony in case of problems. Buyers that bought the notebook from a Sony Germany partner (e.g. Cyberport, Notebooksbilliger.de) can obtain an additional twelve months warranty. In order to get this, buyers must register on the Sony website within 8 weeks of purchasing the device. Otherwise the additional warranty is not valid. When it comes to warranty, Sony support seems lacking. In this price segment, a two year warranty is standard. In some cases there are even warranties for three years provided with the purchased device (like the Lenovo ThinkPad T series and W series). An on-site warranty would also not be something unusual for a buying price of 1600 Euro. A general two year warranty for all customers would certainly be the least that could be expected for such an expensive device. Doesn’t Sony have confidence in its products? Why would the consumer turn to their devices if this is going to be their attitude? Another negative aspect is the fact that only buyers that bought the notebook from certain outlets, and eventually registering with Sony, can take advantage of the additional warranty period. Those wishing to acquire further warranty options, in addition to the standard warranty provided, have several possibilities. A one or two year warranty extension currently costs between 70-90 Euro (~$90-$115) and 75-100 (~$97-$125) Euro respectively. A three year on-site warranty is available for a price of 200 - 250 Euros (~$250-$315). This warranty option has to be acquired within the first 30 days after the purchase of the notebook. The on-site warranty is valid from the day of purchase. Sony has opted for a chiclet keyboard with a number pad. The keys have a decent size of 15 mm x 15 mm. 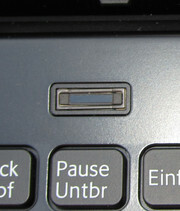 The gap between the keys is 4mm wide. The key travel is sufficient. The pressure point of the keys is recognizable. Nevertheless, it could be a little bit better defined. This would improve the typing feeling. The keyboard yields when typing. In this case we would have expected more stability. All in all, Sony provides an average keyboard in this case. 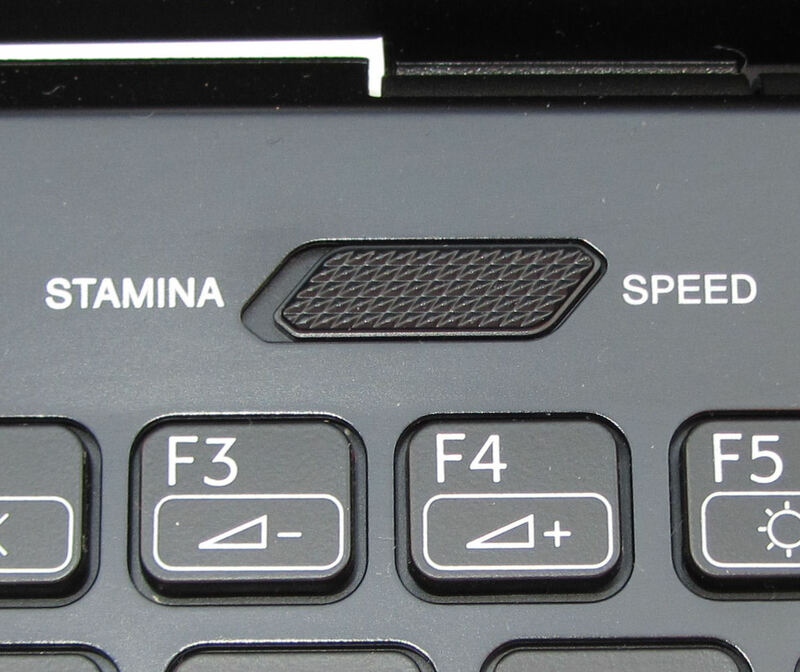 Above the keyboard, Sony has provided a few additional buttons. 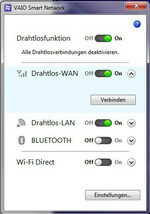 The button "Vaio" starts the "Vaio Control Center", while the button "Web" starts the default web browser. The button "Assist" opens an assortment of Sony programs. This provides tools for problem searching and repair, or a tool for creating a recovery DVD. 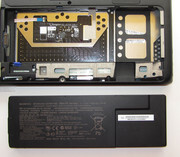 On the left side of the notebook is a button for ejecting the DVD and a switch for selecting the performance profile of the notebook (more information regarding this is available in detail in the following sections of the article). Sony equips the SV-S1511X9E/B with a 6.7 cm (~2.63 in) x 11.9 cm (~4.69 in) Clickpad from "Synaptics". A Clickpad is a touchpad without distinct mouse buttons. 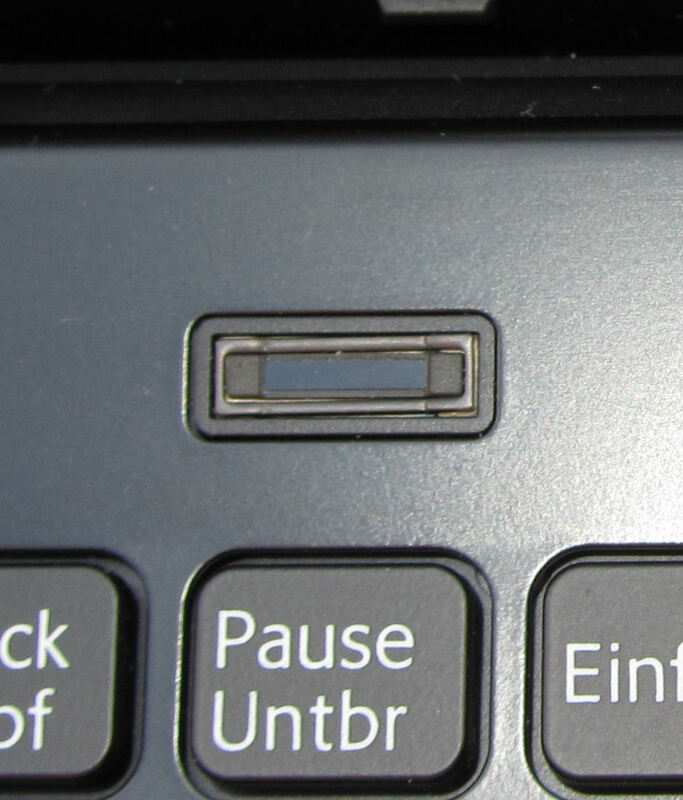 The whole Clickpad is a single large button. When pushing the lower part of the pad, this is interpreted by the Clickpad - depending on the position - as a left or right mouse click. The Clickpad offers good feedback for a click. This is clearly noticeable, and the press needed is neither too firm nor too soft. The surface of the Clickpad allows the fingers to glide without problems. Drag and drop also works without difficulties. The pad is multi-touch capable, and supports functions such as zooming pictures by using two fingers. One thing that turned out to be quite annoying is that the Clickpad doesn't recognize clicks in the lower third of the area. When pressing in this area to start an application, nothing happens. Something like this may sound like a minor issue, but does prove to be rather aggravating during the test. 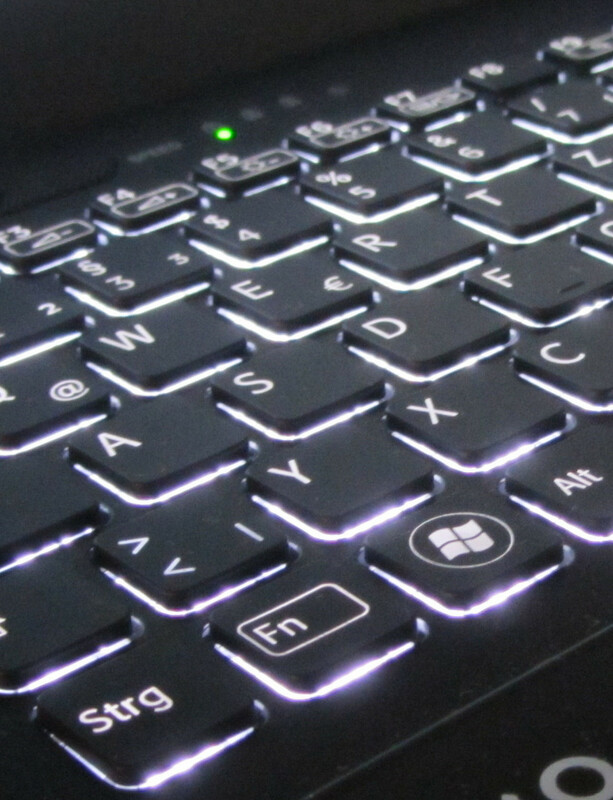 The chiclet keyboard has a backlight. Sony has included a Clickpad. The highlight of the notebook is the display. Sony has equipped the device with a 15.5-inch display that has a resolution of 1920x1080 pixels (Full HD). 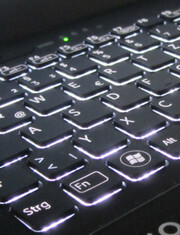 The IPS display is illuminated by LEDs. 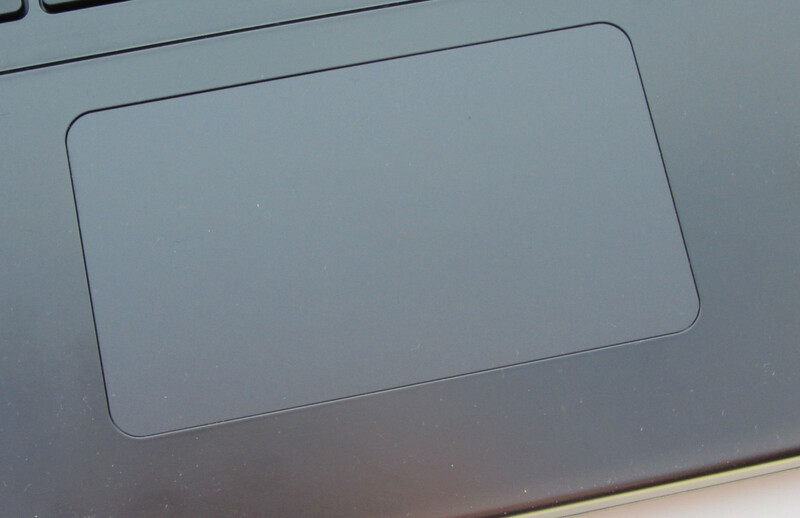 Many online shops describe the display surface as matte. This is not the case. 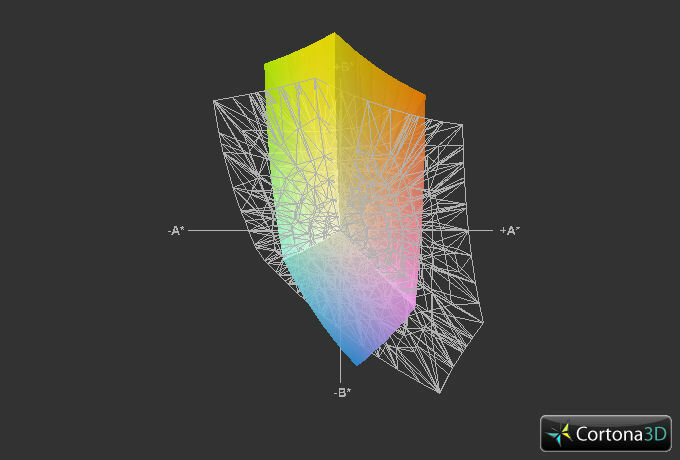 We would describe the display as having low reflectivity. It reflects significantly less than most comparable displays. The make and model details couldn't be determined. Sony provides significantly more in this case than most of its competitors. Usually displays have a resolution of 1366x768 pixels. In some cases notebooks with displays that have a resolution of 1600x900 can also be found. A Full HD display doesn't come around every day. The average brightness of 246 cd/m² in this case is pretty good. The brightness of the older VPC-SE2M9E/B is a little lower at 238.3 cd/m², and the Acer Aspire Timeline Ultra M5-481TG display brightness is significantly lower at 194.7 cd/m². Only the Toshiba Satellite P855-107 with a display brightness of 257.9 cd/m² delivers a better value. When it comes to the contrast and black level, the Sony SV-S1511X9E/B is able to make a convincing impression. The black level lies at 0.47 cd/m². Black areas of the screen are also displayed deep black without gray tint. The contrast ratio of 555:1 can be described as very good. The Sony notebook is on a level comparable to that of the Toshiba Satellite P855-107 (0.48 cd/m², 550:1) in this case and significantly above that of the Acer Aspire Timeline Ultra M5-481TG (1.25 cd/m², 159:1). Only the Sony's predecessor, the VPC-SE2M9E/B delivered better results (0.41 cd/m², 622:1). 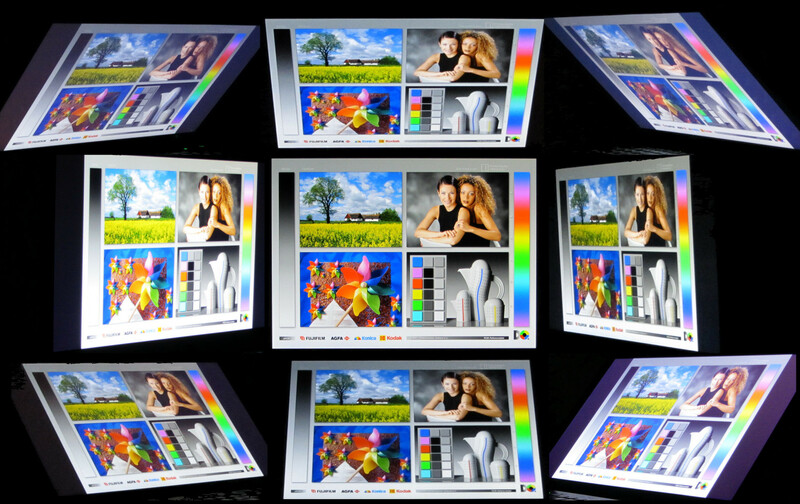 For professional graphics and image editing, the display is not good enough though. Neither the sRGB nor the AdobeRGB color spaces are covered. Thanks to the brightness of the display, the notebook is also usable outdoors. In this scenario, the device also benefits from the low reflectivity of the display surface and the high contrast ratio. Direct sunlight should still be avoided. The viewing angle stability of the display is very good. Turning and moving the notebook is possible without ruining the displayed images. Only the contrast and brightness fall to a small extent at wide viewing angles. It is therefore possible to several people crowding around the display at the same time without problems. Sony concentrates on the multimedia aspect of the user experience with the SV-S1511X9E/B. The quad core processor and the powerful graphics enable the use of the laptop for tasks like video and photo editing and the 1080p screen can be taken advantage of when viewing Blu Ray quality videos. Since the notebook doesn't have a Blu-Ray drive, we tested the playback of Full-HD video content with a test video (1920x1080 pixels, H.264). The processor utilization always lies below 10 percent and in many cases, as low as0 percent. The primary task of decoding is performed by the decoder integrated into the Intel HD Graphics 4000 graphics chip. Day to day tasks, such as text processing, reading/writing of emails, and surfing the internet, don't pose a significant challenge for the notebook, and are carried out without difficulties. 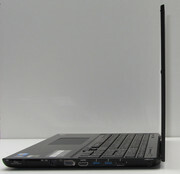 In the introduction we wrote that the Sony SV-S1511X9E/B is a multimedia notebook that could appeal to business users. At this juncture it is already abundantly clear that Sony has not created a business notebook. 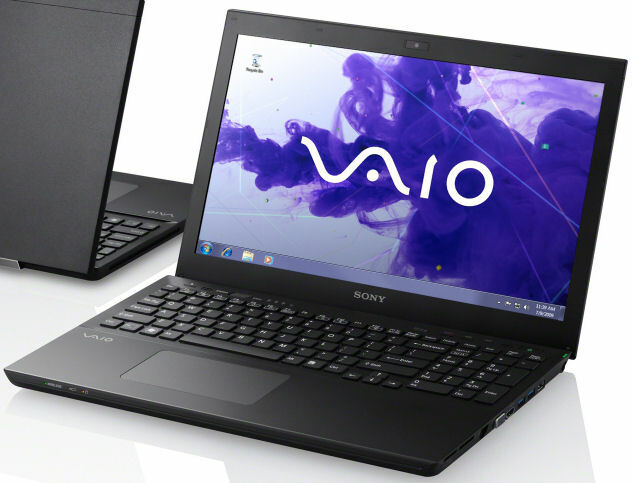 Sony has improved a multimedia notebook with a few business features (docking port, fingerprint reader, connector for external battery, TPM). For a real business notebook, there are still a few interfaces (e.g. DisplayPort, DVI-D) and comprehensive warranty options that are missing. Sony has equipped the SV-S1511X9E/B with a quad-core Core i7-3612QM processor from Intel. This processor is based on the Ivy Bridge architecture. The default clock speed of the CPU lies at 2.1 GHz. Meanwhile the clock speed of all the cores can increase to up to 2.8 GHz, or 3 GHz for two cores and up to a maximum of 3.1 GHz for a single core. The technology that makes this possible is described by Intel as "Turbo Boost". Overclocking of the CPU cores takes place automatically. When fully utilized (tested using "Prime95" and "Furmark" at the same time) the CPU only operates at a base clock speed of 2.1 GHz. Turbo Boost is not active. During the Cinebench benchmarks the Turbo Boost was activated. 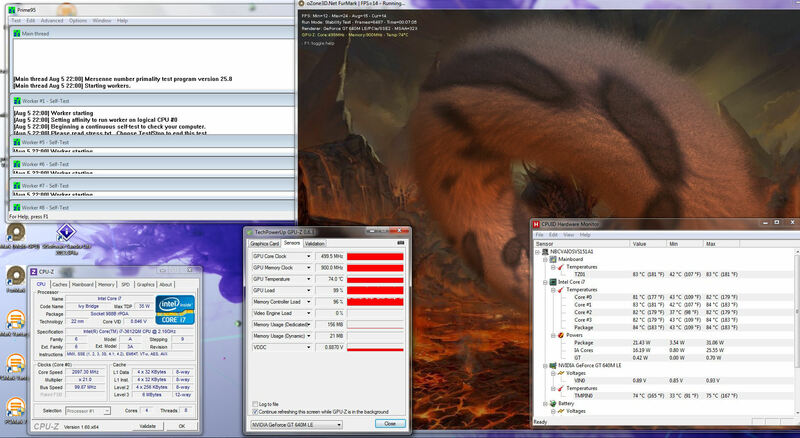 All four cores consistently worked at 2.8 GHz. In some cases two cores were overclocked to 3 GHz. The results of the Cinebench tests were in line with our expectations. During battery powered use, the clock speed of the CPU is limited to 1.2 GHz (throttling). The Nvidia graphics chip operates at 500 MHz when battery powered as well as when running on the mains. Turbo Boost is also not active in this case. The reason for this is elaborated upon in the following sections. The processor can theoretically support up to 32 GB of RAM. However, Sony has limited this amount to a maximum of 12 GB of RAM. Four Gigabytes of RAM are permanently soldered into the device. The reason for this is probably the slim chassis. 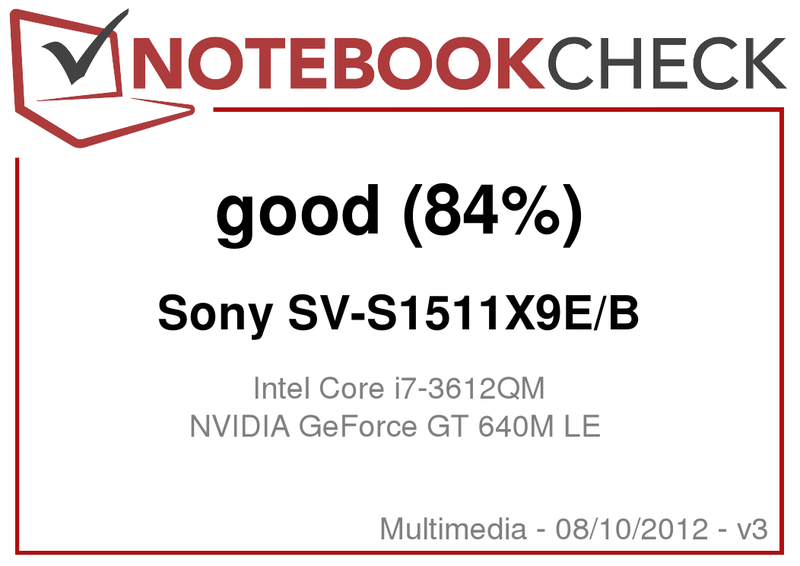 Sony has clearly created a notebook with the SV-S1511X9E/B, that is aimed at multimedia use including video and image editing (corresponding software is included). In the instance of video and image editing, there is no such thing as too much RAM. Users won't want to make any compromises when it comes to a 1600 Euro notebook. The possibility of upgrading to 16 GB of RAM should be a given. The day to day performance of the notebook doesn't give any reason for criticism. Application response to input is quick and without delays. Windows 7 boots up very quickly. The results of the PCMark benchmark were in line with our expectations. Competitors such as the Sony VPC-SE2M9E/B, Acer Aspire Timeline Ultra M5-481TG, or the Toshiba Satellite P855-107 are thoroughly outperformed which certainly due to the fast Solid State Drive. The included mass storage device represents another highlight of the notebook. Sony has opted for a Solid State Drive from Samsung which has a storage capacity of 128 GB. More precisely, the SSD option features an array of two SSDs, each of which has a capacity of 64 GB. 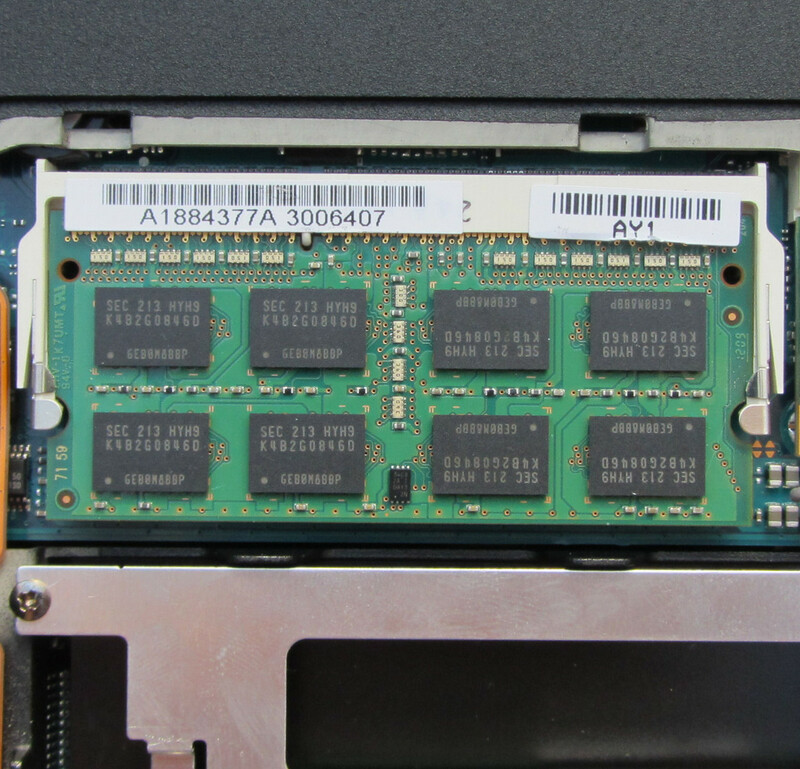 The two SSDs operate together in a RAID-0 array. This theoretically should increase the read and write speeds of the hard drive in all scenarios. 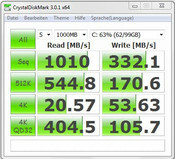 The SSD is very fast. The memory reacts quickly and without delays. Windows 7 boots up quickly. The read speed lies at about 900 MB/s which is a very good value. The write speed lies at approximately 300 MB/s. This value is a little disappointing though, since we already tested SSDs with higher write speeds that weren't part of a RAID-0 array. Unfortunately, out of the 128 GB, only about 52 GB are usable. About 30 GB are used by the recovery partition. The remaining 46 GB are occupied by Windows 7 and the pre-installed software. Even a capacity of 128 GB was very little for a multimedia notebook used for video editing, the available 52 GB even more so. Those planning to use this notebook for video editing should at least consider a model with more data storage capacity. Those wanting to delete the recovery partition and additional programs should make a disc image prior to doing so as a precaution. Otherwise the pre-installed programs would be lost and these are not included separately on a DVD. The corresponding tool to generate recovery DVDs is already installed by Sony. The graphics processing is performed by the Intel HD Graphics 4000 graphics chip and the dedicated Nvidia GeForce GT 640M LE graphics chip. The GeForce graphics chip is always used when a lot of processing power is required, especially when gaming. The Intel graphics chip is good enough for basic tasks like media consumption - online and offline. Switching between the two graphics chips is carried out automatically with software and users don't have to take any action in this case. The technology from Nvidia that makes it possible is called "Optimus". The Nvidia GeForce GT 640M LE graphics chip has 2 GB of dedicated graphics memory to make use of. In this case we are dealing with a slightly slower version of the GeForce GT 640M graphics chip. The base clock speed of the GT 640M LE chip lies at 500 MHz, while the regular GT 640M operates at 625 MHz. The GeForce GT 640M LE chip can be overclocked up to a speed of 570 MHz. The DirectX 11.1 capable GPU is powerful enough to be considered as a middle-level GPU. The Intel solution supports DirectX version 11, and is able to operate in a range between 350 MHz and 1200 MHz. It shows a marked improvement over the last generation HD3000 IGP. During our full utilization test (whereby the notebook carries out the tests "Prime95" and "Furmark" at the same time) the GeForce GT 640M LE consistently operated at a speed of 500 MHz on the battery as well as when running directly from the mains. The GPU may not throttle, but also doesn't fully use the available performance reserves up to 570 MHz. This is also reflected in the results from the 3DMark benchmarks. Other notebooks, which contain the same graphics chip like the Acer Aspire Timeline Ultra M5-481TG (Nvidia GeForce GT 640M LE) offer better results in this case. The reason is explained a little later in this review. The older Sony VPC-SE2M9E/B (AMD Radeon HD 6630M) is clearly outperformed by the SV-S1511X9E/B. But compared to the Toshiba Satellite P855-107 (Nvidia GeForce GT 640M), the SV-S1511X9E/B simply doesn't stand a chance. The Sony SV-S1511X9E/B is definitely able to run current games without difficulties. The results of the different 3DMark versions already allude to good gaming performance. A practical test with various games confirms this assumption. All the tested games were playable with a resolution of 1366x768 pixels while using high quality settings. The frame rates were good enough for smooth game play. Even with the Full-HD resolution using the highest quality settings, it is still possible to play certain games. Although this can lead to a lot of juddering and gaming at these settings cannot be recommended. The influence of the GPU Turbo is noticeable when comparing the results to those of the Acer Aspire Timeline Ultra M5-481TG. This device possesses the same graphics chip as the reviewed device. The Acer however utilizes the GPU Turbo, and delivers an average performance advantage of 15% higher frame rates, despite its weaker ULV CPU. 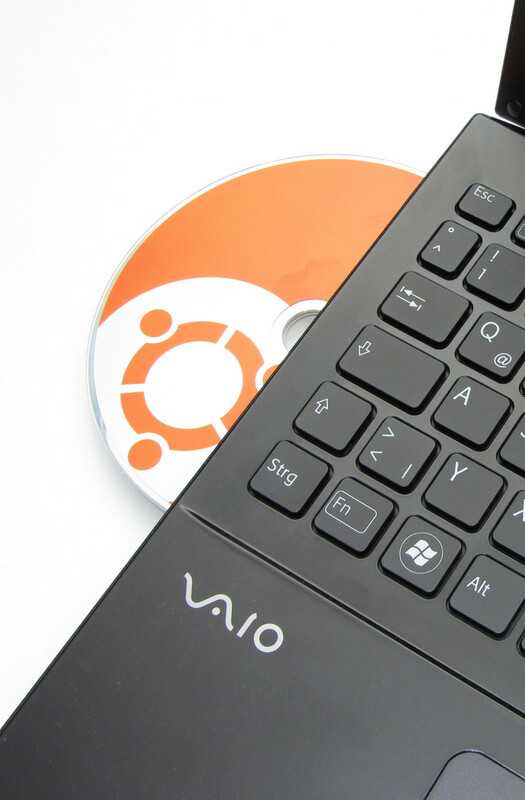 Sony has managed to create a very quiet notebook for simple workloads. In an idle state, only a quiet constant humming of the cooling fan is audible. In this respect Sony definitely has to be praised. Especially considering that a quad-core processor and a dedicated GPU are present in the device. It gets louder when the DVD drive is in use. The peace and quiet is over and done with when the full processing power of the device is required. During our peak performance test ("Prime95" and "Furmark" running in parallel) the notebook edges on the 50 decibel mark, at which point, we consider the noise level a little too disturbing. Even with a little less utilization (only Prime95 running), the device still reaches about 45 dB which is a level that is still perceived as loud. The Sony SV-S1511X9E/B during stress test. While in an idle state, the temperatures are definitely in the green area. The notebook reaches temperatures between 28 and 35 ºC on the top and bottom of the device. These temperatures allow for comfortable working, and the notebook can be rested on a lap without problems. The latter should be avoided when the notebook is fully utilized though, since the bottom temperatures reach up to 50 ºC. The palm rest on the other hand, remains within a comfortable range even when the notebook is fully utilized. The CPU didn't show any signs of throttling during the stress test when connected to the mains. It operated at a constant 2.1 GHz. While battery powered, the CPU was throttled to 1.2 GHz though. Long lasting ("Stamina") or high performance ("Speed"). 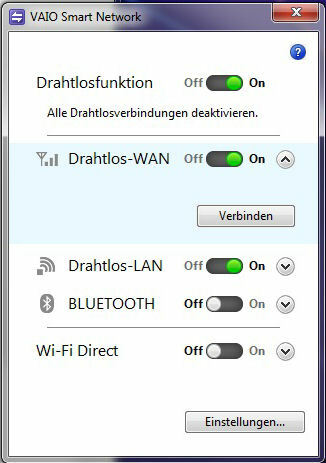 Three operating modes are available in the Vaio Control Center. 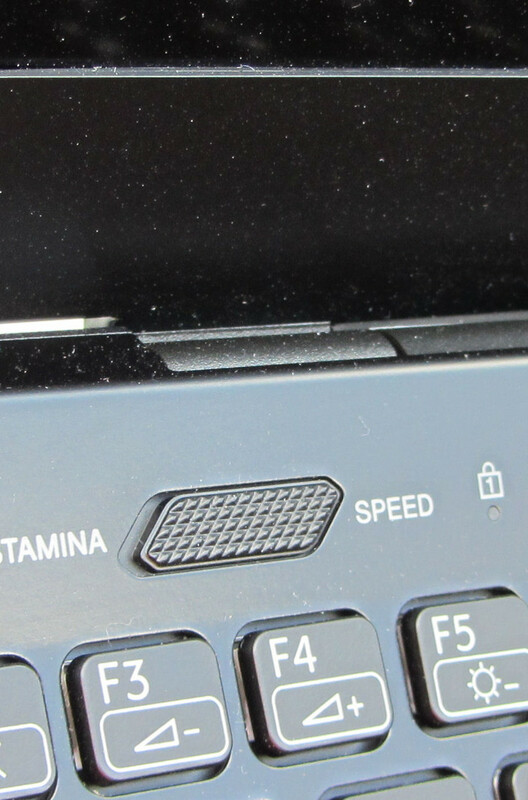 The Sony SV-S1511X9E/B has a control for determining whether the notebook should operate at full power ("Speed") or whether it should achieve the longest possible battery life ("Stamina"). The precise definition of the terms "Speed" and "Stamina" can be determined with the help of the Vaio Control Center. Both switch settings can be assigned one of three possible operating modes: "Priority: Cooling" (=maximum performance), "Balanced", and "Priority: Quiet Operation". We test the notebooks as they are delivered to the customer. All the tests were carried out using the "Speed" option. The default setting upon delivery is "Balanced". Thus the processor and GPU don't always operate at their performance limits and during our peak performance test, the Turbo Boost was not active. 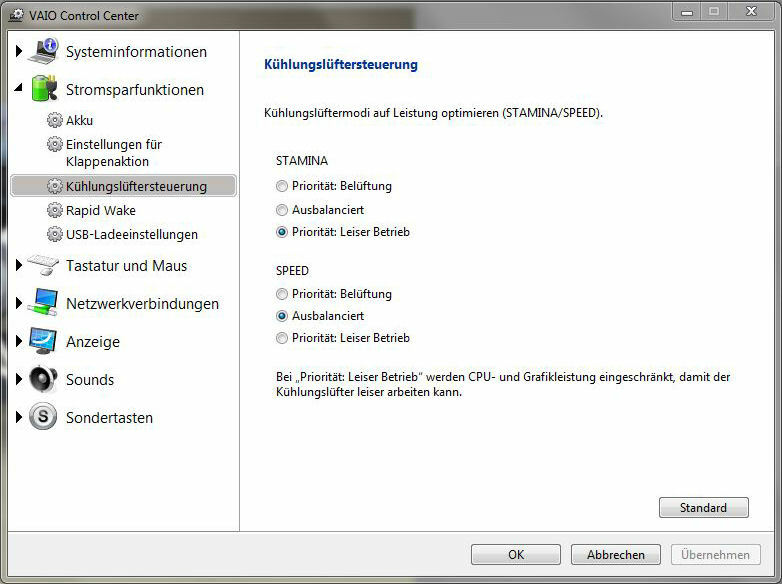 Those wanting to take full advantage of the maximum performance capabilities of the notebook have to choose the option "Priority: Cooling". The peak performance test is then carried out with Turbo Boost activated. However, the Turbo Boost performance is reduced after a few minutes. On top of this, the selection of this mode also brings with it raised cooling fan activity which increases system noise. The "Balanced" mode established itself as a good compromise between performance and system noise in our opinion. 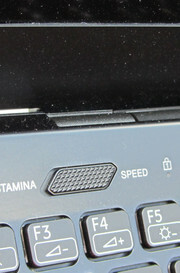 The included stereo speakers are located above the keyboard. Sony hasn't reinvented the wheel in this respect, and provides speakers that sound like those on most other notebooks. The sound clearly lacks depth. The mid and low-range frequencies lack strength. Speech is easy to understand, but nevertheless sounds a bit tinny. If you intend to watch movies with the notebook, the speakers will suffice. Sony provides the notebook with the "Dolby Home Theatre" software that can improve the audio quality when activated. In this case the speakers sound slightly better. The Sony SV-S1511X9E/B is delivered with an AC adapter which is able to provide a maximum of 92 W. During daily use, the notebook doesn't require this amount of power. We measured power consumption between 7 and 15 W in the idle state. When fully utilized however, the power consumption rises rapidly. At peak performance ("Prime95" and "Furmark" running in parallel), we measured a power consumption of just under 73 W. When Prime95 or Furmark are run individually, the power consumption is approximately 50 W in both cases. During normal workloads, such values aren't encountered. Those using the notebook exclusively for office tasks or watching DVDs, receive a very efficient device. The Sony SV-S1511X9E/B reaches a battery runtime of 7 hours and 47 minutes in the idle state. We tested the idle operation with the BatteryEater Reader Test. In this case, the screen is used with minimum brightness, and the power saving profile is activated while the wireless module (WLAN, Bluetooth) is deactivated. 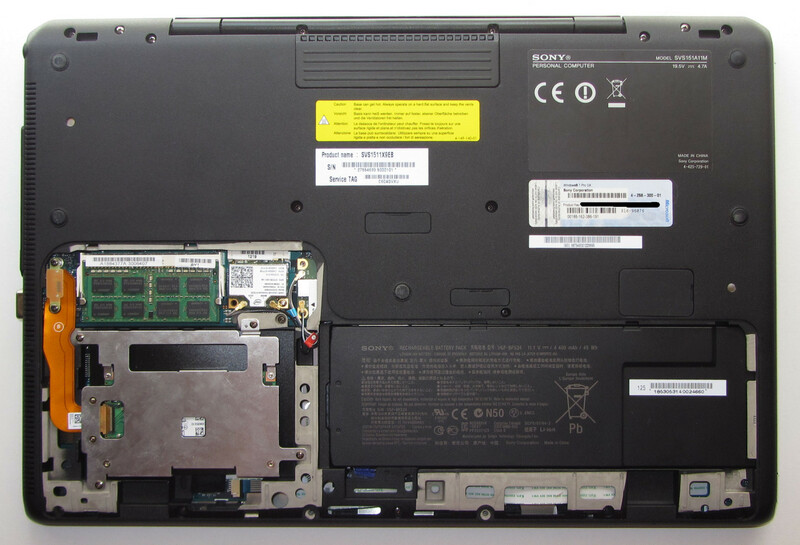 With a high processing load, the Sony notebook gets battery life of 1 hour and 7 minutes. This scenario was tested using the BatterEater Classic Test. In this case, the display is at maximum brightness and the high performance profile and the wireless module are active. A battery life of 4 hours and 34 minutes is achieved by the notebook during the WLAN test with a fully charged battery. During this test, a script repeatedly loads websites every 40 seconds. In this case, the power saving profile is active and the display brightness is set to about 150 cd/m². 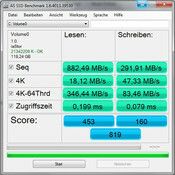 A battery life of about 4 hours and 46 minutes was achieved during the DVD test. This should be enough to watch two full-length movies. For the DVD test, the wireless modules were switched off and the display was set to maximum brightness. The performance profile was set to either power saving or higher performance (in case the DVD did not play smoothly). The battery life is very good for a quad-core notebook. Many notebooks with dual-core processors don't manage to hold out for these lengths of time. Competitors such as the Toshiba Satellite P855-107, or the Sony VPC-SE2M9E/B, are beaten in every case. The Sony SV-S1511X9E/B can't compete with the Acer Aspire Timeline Ultra M5-481TG though, since the Acer uses a ULV processor. 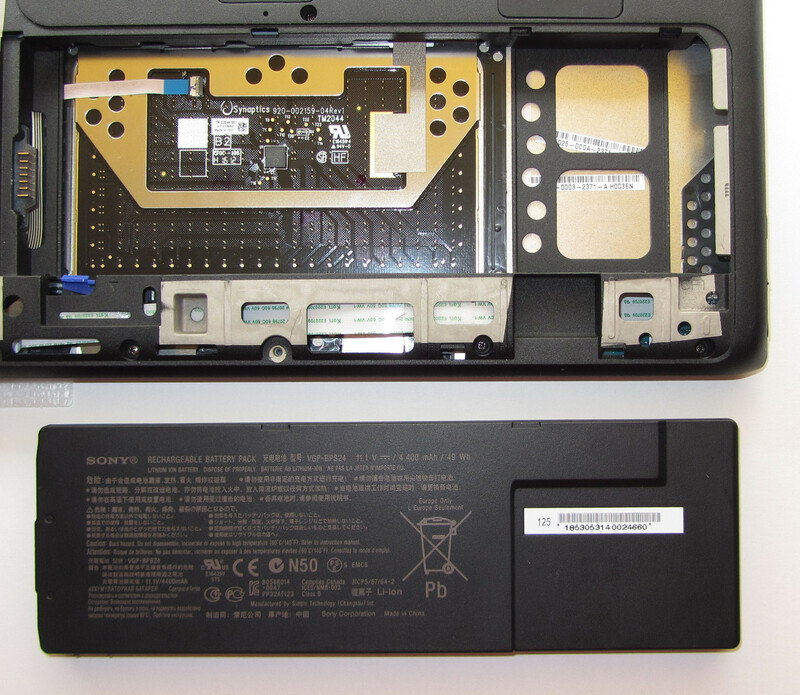 Sony has an additional battery available for the reviewed notebook. This battery ("VGP-BPSC29") can be attached to the bottom of the device, and has a capacity of 49 Wh. The battery life should more or less be doubled in case this is used. The price of the battery lies between 120 and 180 Euro (~$150 - $225). The "S" stands for a series of cars from a large German automotive manufacturer which are technically the best of the best and for which the highest quality materials are used for manufacturing, and put out the best performance possible for a machine with these specifications. Sony seems to have transferred this model to their S-Series of notebooks: Great display, a light magnesium case, and a fast SSD. A highlight of the notebook is the display. In case a good display is the decisive criteria for the purchase of a notebook, then the reviewed device certainly deserves a closer look. Also, those looking for a light 15.5 inch notebook could strike it lucky with this device. Nevertheless, a look at other value for money notebooks could definitely be worthwhile, since many users could find a better solution with an alternative. The great display and the light case are part of the features of every model. With regard to the service, things don't look quite as good. The upgradability was limited by Sony unnecessarily and there is only one year of warranty. Not to be forgotten is the price of the notebook. Gaming aficionados will not enjoy the experience on a throttled GT 640M LE graphics card. The notebook is relatively thin. This can be removed without difficulties. The battery weighs 310 grams, and has the dimensions 21 cm x 6.9 cm x 1.2 cm. 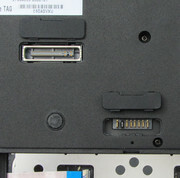 ...a docking station port (left), and the connector for an external battery. All connectors are protected by plastic covers. Access to Windows can be restricted by the fingerprint reader. The required software is pre-installed. ...and is able to deliver up to 92 W of power. Heat is dissipated out of the back. A warning from Sony about high temperatures. 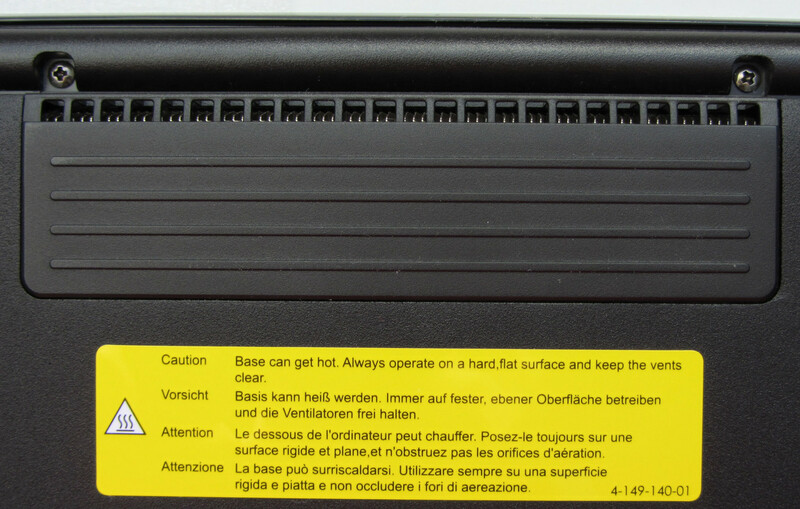 The battery is also concealed behind the maintenance panel. Full access is available to the WLAN module, and the antenna for the UMTS module. ...and is a success aesthetically. The hinges are placed towards the center of the notebook. Sony has included a slot-loaded DVD burner. This reads and writes every type of DVD and CD. The power button, and the power indicator both glow green. On the bottom there is a large maintenance panel. This is the hard drive in our reviewed device. 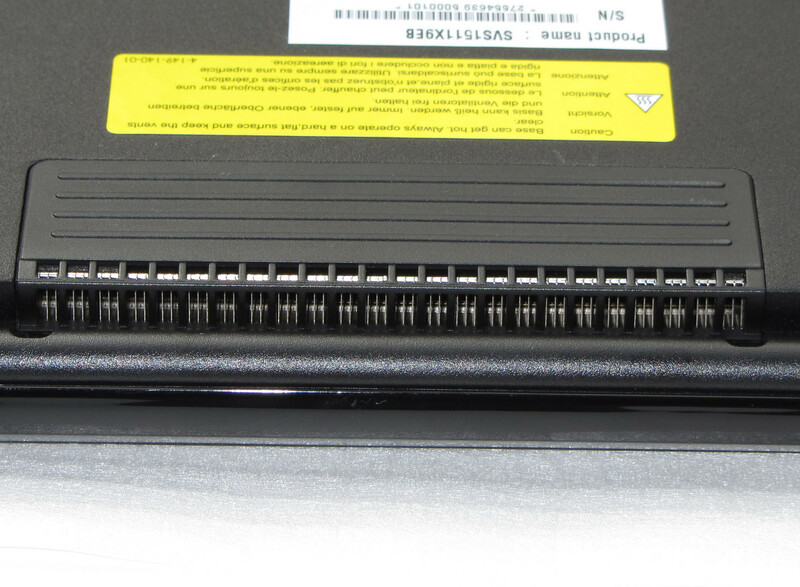 There is only one replaceable RAM module. This can be upgraded to a maximum of 8 GB. The great IPS display. In this case, other manufacturers could take a leaf out of Sony's book. A longer warranty period. Anyone who spends such a large amount on a notebook will also want it to last a long time and be supported by the OEM for that period too. The battery life is very good for a notebook with a quad-core processor. Among the competitors are the Sony VPC-SE2M9E/B, the Acer Aspire Timeline Ultra M5-481TG and the Toshiba Satellite P855-107.